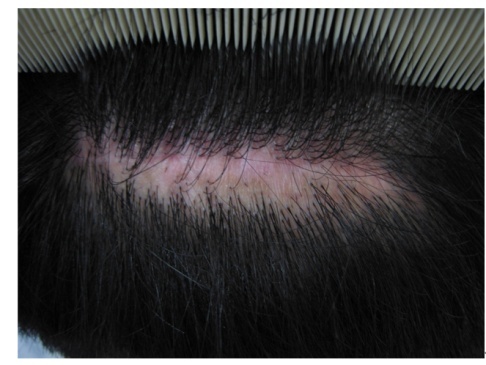 Transplanted hair starts growing again 3-5 months after temporary hair loss and shows maximum aesthetic effect by 1 year after the transplantation. Such delayed effect for several days or weeks is the difference of hair transplantation from general plastic surgeries that shows immediate effect. Compared to permanent growth of transplanted hair, loss of the existing hair continues over time, making the appearance even worse than before the transplantation or aesthetically unnatural. Since patients cannot accept such condition easily, clinicians may often experience various difficulties if they don’t provide full explanation on the subject in the course of consultation. During the last 15 years of experience in hair transplantation, I would meet patients who could not satisfy with relatively good result and those who could satisfy with objectively not very good result. Patient’s satisfaction on the outcome may be expected by overall consideration of the patient’s accurate condition and expectation during a consultation, which is why consultation before a surgery is as important as the surgery itself. In addition, appropriate behavior to establish a good rapport between the clinician and patient is most important, because inappropriate behavior of the clinician or other medical staffs may lead to the patient’s disappointment, and even to a medical dispute for a not very bad surgical outcome. Patients often wait for months or years before visiting the hospital, rather than receiving a care immediately, even if they had known the hospital and the medical staff in advance. They also tend to make an inquiry by telephone before visiting the hospital in person. The attitude of the person who answers the phone call may play as a key factor in determining whether or not to visit the hospital. Since telephone answering contributes to the first impression of the hospital, good telephone answering may have influence on the clinician-patient consultation. Staffs who answer telephones need to have enough knowledge on hair transplantation and answer the caller’s question sincerely. Warm-hearted response is effective not only for patients but also for a third person, including parents, wife or friends, who made a phone call instead of the patient, also contributing to the establishment of better rapport. It is very important to welcome a new patient warmly with a smile. Patients who visited for hair loss should be questioned kindly about the present medical history, family history and past medical history. Information about the patient’s job, family, hobby and sports may be also helpful for understanding the patient’s psychological, social and financial status and even for determining the possibility of hair transplantation, the number of hair strands to be transplanted, and the cost of transplantation. Clinicians should keep in mind that the patient visited the hospital not just due to the lack of hair and that the patient might feel withdrawal and defensive at the same time due to the hair loss. Clinicians are recommended not to use direct phrases such as “you will look much younger with more hair after transplantation’ or ‘you will feel more confident’, because such expression might stir negative emotions about the patient’s appearance in his/her mind and hurt the patient’s feeling. Patients often ask ‘what are the processes of the surgery?’ not because he/she wants detailed explanation of the surgical process but because he/she is afraid of the hospital, hemorrhage, surgery or pain. Thus, the clinician needs to answer the patient’s question in a way that could reduce the patient’s fear. Patients can learn detailed surgical process from a pamphlet; excessively detailed explanation by the clinician using photos and such may rather increase the patient’s fear about the surgery. Various patient factors, including age, the degree of hair loss and the characteristics of the donor hair, may have influence on the satisfaction and objective outcome of the surgery. Even a highly experienced clinician needs to review various patient factors sufficiently during a consultation. (1) Age: Male pattern hair loss develops after adolescence and even early 20s often ask for hair transplantation due to progressive hair loss. Surgery would be inevitable if hair loss has progressed a lot even in young patients; however, if hair loss is not severe, hair transplantation needs to be delayed as long as possible or only minimum donor hair should be collected and the donor hair should be preserved for later in case the hair loss progresses (Figure 1). Generally, young male patients in their early- to mid-20s tend to have less satisfaction than middle-aged (40-50s) patients due to higher expectation about the outcome. Care should be taken as well because younger patients tend to have donor site scar more frequently than middle aged patients (Figure 2). Older patients in their 60-70s have lower expectation and thus higher satisfaction about the outcome, if they have no other physical condition. They also tend to experience donor site scar less frequently, making them more appropriate for hair transplantation (Figure 3). Figure 1. Son before the surgery (26 years old, left) and father 1 year after surgery (56 years old, right). The son needs to preserve the donor site because he is highly likely to develop hair loss as his father. Figure 2. Care should be taken in young patients in their 20-30s, who tend to experience a larger scar than middle aged or older patients due to their active wound healing process. Figure 3. 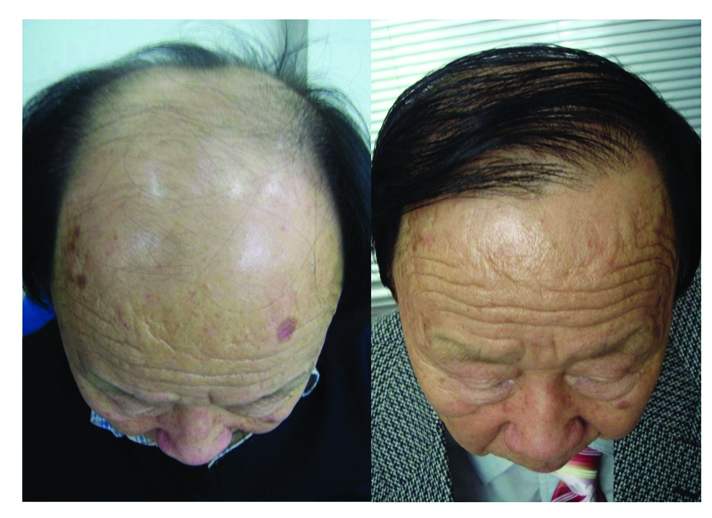 A 75-year-old male patient before (left) and 1 year after (right) 2,500 strands of hair transplantation. Hair transplantation is relatively more satisfactory among middle aged patients in general. (2) Thickness of the donor hair: According to western standard, hair is considered as thick at ≥80㎛ thickness and as thin at ≤60㎛. 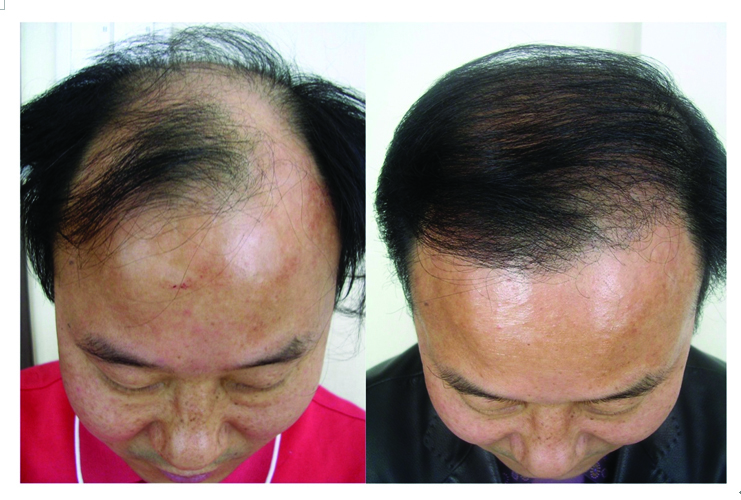 Thicker donor hair contributes to increased volume of the transplanted hair and thus better outcome (Figure 4). 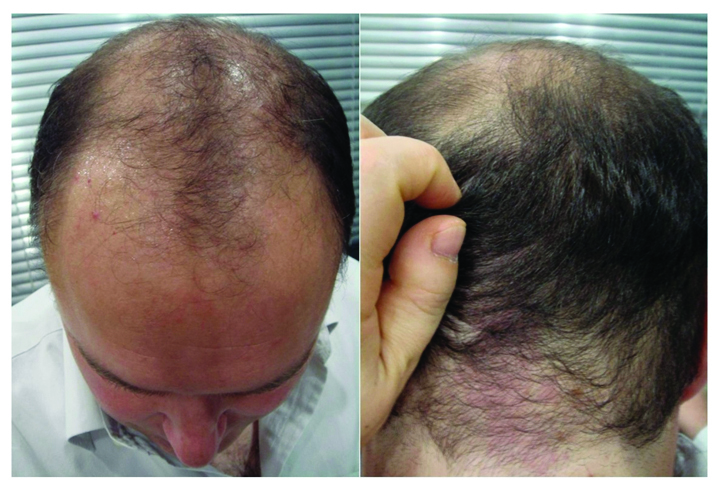 Thin donor hair leads to less hair volume and less coverage of the scalp, resulting in decreased aesthetic effect (Figure 5). It is important, therefore, to measure the donor hair thickness to predict surgical outcome. Hair thickness can be measured by using a microscope or more recent computerized devices for easier measurement. Figure 4. 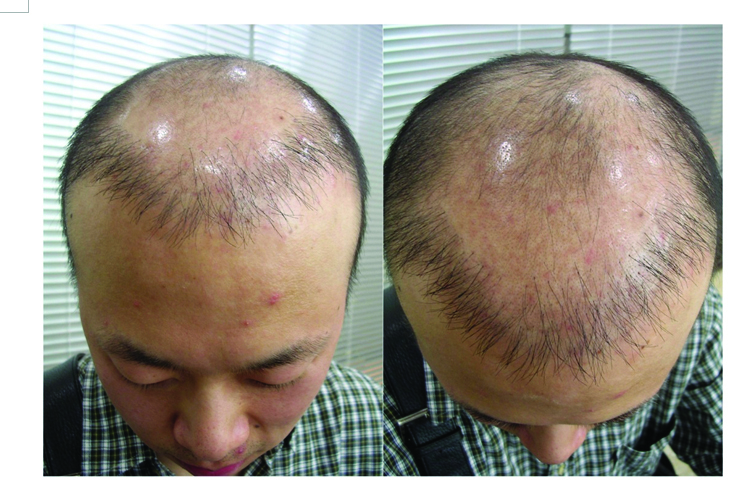 A 25-year-old male patient before (left) and 1 year after (right) 2,500 strands of hair transplantation. Thick hair contributes to a better aesthetic outcome even with a small amount. Figure 5. 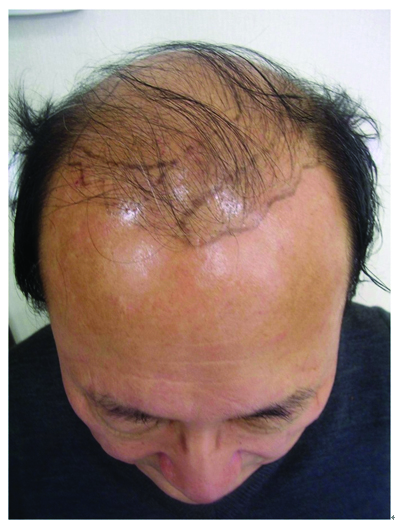 A 55-year-old male patient 1 year after 2,000 strands of hair transplantation. 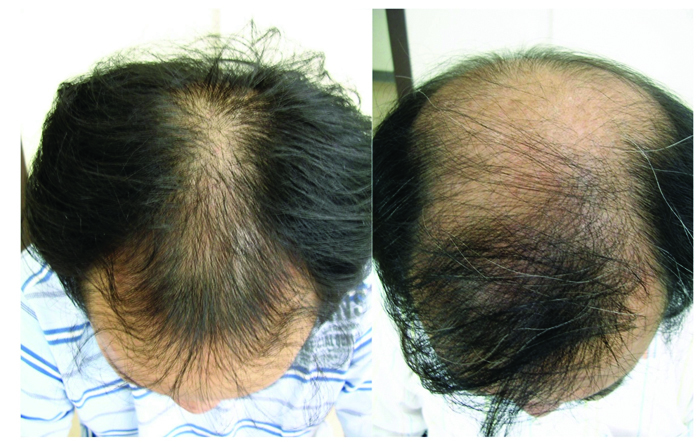 Thin donor hair results in poorer aesthetic outcome. (3) Density of donor hair: The average number of hair strands in the occipital region is around 130/cm2 in Koreans, and 90% of them are terminal hair. The density can be considered as high if the number of hair strands is higher than this; higher density is associated with higher frequency of 2 hair Follicular Unit (FU) and 3 hair FU, as well as the tendency of better outcome (Figure 6). On the other hand, lower density or higher frequency of 1-hair FU is associated with poorer outcome (Figure 7). People generally think that male pattern hair loss develops only at the forehead or the crown of the head and not at the occipital region, which is not true. Occasionally, hair loss occurs at the lower region of the occipital region at the occipital region, in which case the donor hair becomes thin, ultimately resulting in the hair loss of the donor site. 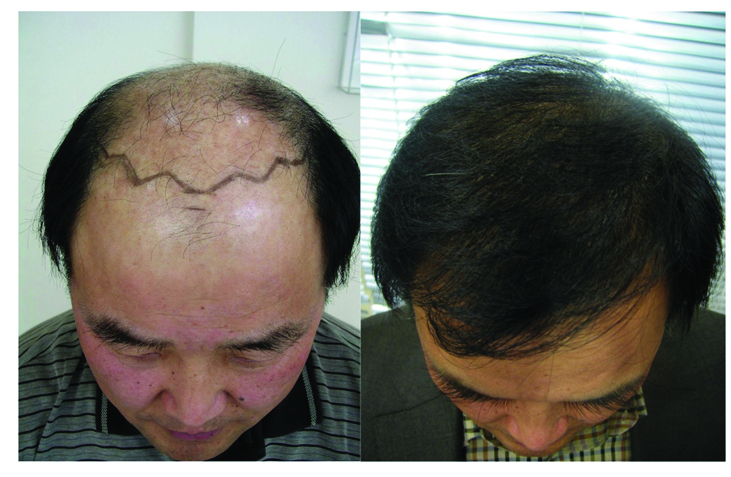 Hair transplantation should not be performed in this case (Figure 8). Figure 6. 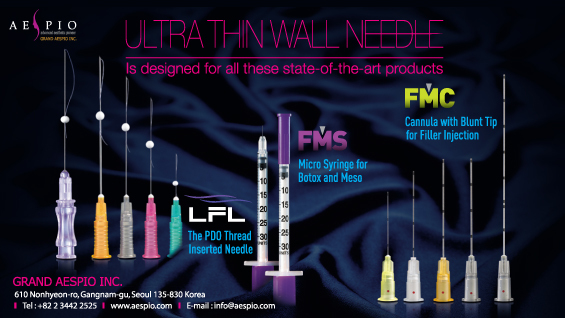 High frequency of 2-3 hair follicular unit or high density of donor hair contributes to good aesthetic outcome. Figure 7. High frequency of 1 hair follicular unit and low density of donor hair results in relatively poorer outcome. Figure 8. Hair loss may develop at the occipital region, which is the donor site. Transplantation should not be performed in this case because the hair collected in this condition will fall out immediately after transplantation. (4) Extent of hair loss progression: The extent of male patter hair loss is determined by the widely used Norwood classification. Patients in early phase of hair loss, such as in Norwood 1, 2 and 3, generally have higher expectation to have abundant hair at the transplanted area, and thus tend to feel less satisfaction. In addition, the transplanted hair will grow in place while the loss of the existing hair continues over time, making the appearance even worse than before the transplantation (Figure 9). On the other hand, patients in Norwood 5-7 stages tend to have lower expectation and thereby higher satisfaction (Figure 10). 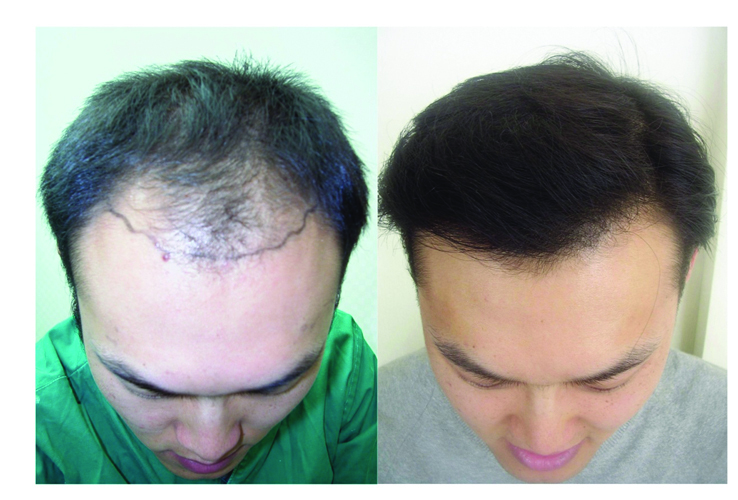 Hair transplantation should be avoided in male patients in their 20s with early phase hair loss (Figure 11). However, male patients in their 50s with early phase hair loss are less likely to develop to severe hair loss in the future. Therefore, hair transplantation can be performed in such patients, but they need to use a hair restorer, such as finasteride, for aesthetic purpose, because the transplanted hair will continue to grow and the hair loss of the existing hair will continue. Figure 9. In young patients with early phase hair loss, transplanted hair will continue to grow while the hair loss of the existing hair will continue, resulting in serious outcome. Medication therapy should be used first while observing the prognosis before determining the time of surgery in young patients with early phase hair loss. Figure 10. Patients with advanced hair loss tend to have high satisfaction and good surgical outcome after hair transplantation. Figure 11. 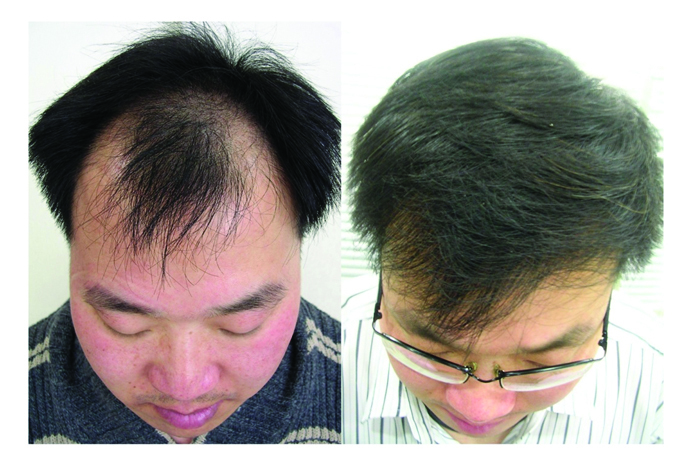 Compared to young patients (left), middle aged patients with early phase hair loss (right) are less likely to develop severe hair loss in the future and are safe to perform hair transplantation. (5) Patient’s expectation: It is very important to confirm the patient’s level of expectation on hair transplantation during the consultation. Patients with unrealistic expectation generally do not satisfy with the outcome and often complain to the clinician. Patients with body dysmorphic disorder also tend to express dissatisfaction about the surgical outcome. It would be wise not to perform a surgery, if possible, for patients who seem overly obsessed with their appearance or are likely to have body dismorphic disorder during the course of consultation for a sufficient time. (6) Present medical history: Hair transplantation is a relatively safe procedure, but care should be taken when there is another physical condition, as with any other surgery. Patients with a hemorrhagic disease that interferes with blood coagulation or those who are currently taking drugs that might interfere with hemostasis (such as aspirin, warfarin, etc.) need to have a consultation with their doctor before determining the surgery. Vitamin E products or other popular supplements, such as garlic juice, onion juice, ginseng juice and green vegetable juice, are advised to be discontinued from 2-3 weeks before the surgery because they dilute the blood and delays hemostasis. Patients with hypertension need to take an antihypertensive drug to lower the blood pressure because bleeding occurs a lot during the surgery. Propranolol and β-Blocker, among antihypertensive drugs, should be changed to another drug by consulting with the patient’s doctor, because these drugs may interact with epinephrine. Patients may also need to consult with their doctor for other physical conditions. Both patients and clinicians will be satisfied with the outcome if the above factors are reviewed comprehensively before determining whether or not to perform hair transplantation.